I was surprised at the volume and immediacy of the responses I received to my last post reviewing Perform Better's latest generation of competition kettlebells. I don't work for WKC, and I did not rely on any information from WKC in writing my review. I uncovered (sometimes literally) the facts for this review myself, and I documented my experiences with photos. 1. 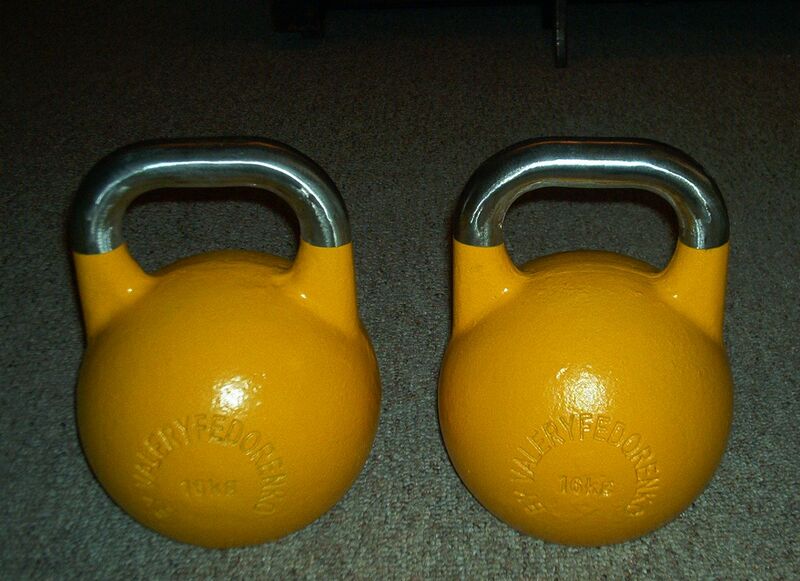 WKC began selling competition-style kettlebells several years ago. Initially, some of them had defects that were covered in bondo and then painted, even in the handle area. There were some complaints about the quality of these early bells. 2. In approximately 2008, WKC began shipping bells with pre-stripped handles, among other upgrades. My 20kg WKC bell is an example. These bells were higher quality than the previous bells, and did not contain bondo-covered defects. WKC stopped selling the previous bells that were of lower quality. 3. At some point, PB began selling the exact same bells that WKC had stopped selling before their upgrade. The bells Perform Better sold were simply WKC's pre-upgrade kettlebell's with WKC's logo (along with any defects) covered with bondo and an epoxy that easily chipped off during normal use. them anymore, and they obviously did not meet WKC's new standards). 5. PB started selling bells with pre-stripped handles. I ordered one to review it, and reported the defects I found. Since that time, some folks have contacted me to say they were happy with their PB bells, but many more have noticed the same defects on their PB bells, including the mysterious tape repairs and sloppy bondo fixes. The 8kg bell seems to be the one most prone to defects, perhaps, as one poster noted, because "8kg bells are the hardest to make and the easiest to [mess] up. The thin shell is the problem. Any defect pretty much equals a hole". However, the defects were noted on many weights of many PB bells, not just the 8kg. I did receive one report from one lifter about a problem with a second or third generation WKC 8kg bell that cracked. He reported: "I had it for a year before it cracked due to it being more frequently used" and that AKC/WKC replaced the bell upon request. The same lifter reportedly purchased 12 new generation PB bells; 5 of them had the tape repair. The five bells weighed 8kg (2), 12kg (2), and 20kg (1) respectively. That same lifter reported that "1 PB and 1 WKC [8kg]bell are exactly identical, down to finish on handle and even shade of pink paint". Taking all of the facts I've gathered together, it strongly suggests that PB and WKC still share a common manufacturer. The most obvious explanation for the difference in quality is that WKC has higher quality control standards; they don't accept defective bells that have been repaired by bondo and tape from the manufacturer. PB does. It's simply a matter of what each company will agree to accept, and then pass on to their consumers. I've since read that many other retailers have begun selling competition-style kettlebells. I may review some of them if I get a chance. In the meantime, I stick with my recommendation that WKC's competition kettlebells are the best buy available. I had a closer look at my Wolverson's (UK brand) since you posted, and I might strip one down one day. It's an absolutely fine bell and I'm very happy with it, though what Balaganov said about "all [Western] bells come from the same source" (i.e. China) struck a chord with me and now I'm curious. 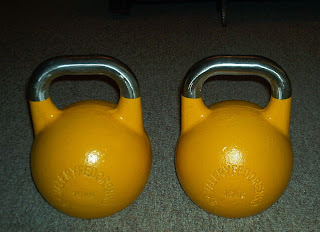 One thing I would love to see stripped down would be one of the new, intermediate weight PB bells (22kg, for example). Not sure if that would still use a WKC casting or not. My guess is that the new PB bells are different castings from the same factory. I really hate it that PB's quality is so inconsistent. They are the only intermediate-size kb distributor that I know of in the US, so if a lifter wants a "tween-size" he has to gamble on quality. This quality issue is so inconsistent with PB's general reputation and image. But its how they have chosen to do business with kettlebells. It'd be interesting to if the Rizhao Land Sea Fitness Goods Co. sells to the parent company of Perform Better as well. Be sure to check the Factory Pictures link! Have fun with this information, all you web sleuths.